In honor of the show's 50th anniversary (Jan 22, 1968), answer the following. Hopefully you won't be doused with water and you'll be invited to the party. Laugh-In was hosted by THESE TWO MEN. Last names are acceptable. Laugh-In was taped at the NBC Studios in THIS CITY'S beautiful downtown. The aforementioned dousing of water in the instructions was often at the expense of Judy Carne as she uttered THIS FOUR WORD PHRASE. Sometimes to spice it up, she'd fall through a trap door instead. No Laugh-In quiz would be complete without the most famous [Answer to Q3] moment. Yes, Richard Nixon said that phrase. No, he wasn't doused or dropped down a trap door (if only...). That said, he was originally asked to say this OTHER POPULAR FIVE WORD PHRASE OF THE SHOW, the last word of which is a euphemism for any random body part (usually one's posterior), but instead opted for the other popular phrase. Ernestine the phone operator, known for her phrase "one ringydingy....two ringydingies...." was portrayed by THIS ACTRESS who also played 5 1/2 year old Edith Ann (and that's the truth- Pbbbt!). A recurring sketch was when Tyrone F. Horneigh (pronounced "hor-nye") would try to pick up Gladys Ormphby in the park, often with him being beaten down with Gladys' purse. One pick up line would involved Tyrone offering Gladys THIS BRAND OF CANDY with the usual purse beatdown result. "Here Comes the Judge" is also in the pantheon of memorable Laugh-In phrases. For most of the time Laugh-In was on the air, THIS SINGER would sing this phrase and walk off, often after giving a joke/rap to introduce the next sketch. Due to the popularity of the phrase "Here come the Judge," THIS MAKE AND MODEL OF CAR unveiled their own "Judge" in 1969. Ergo, Laugh-In launched the muscle car craze. The cast of Laugh-In was used to make the instructional film "Freeze-In," used by THIS COMPANY to teach their salespeople the newest features of their freezers and refrigerators. "The Devil made me do it!" 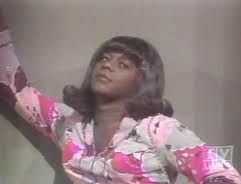 was the catchphrase of THIS CHARACTER seen here made famous my Flip Wilson. Alan Sues would at times portray THIS TWO WORD TITLED CHARACTER known for his clueless sports reporting and his small "tinkle" (bell). His name is similar to a character from South Park minus one very obvious moniker that could have been applied to Sues' character as well if not for those meddling NBC censors (plus the fact it was 1968). Jo Anne Worley and later Patti Deutsch played Fanny to [one 1/2 of the answer to Q1's] Frank, the parents in THIS LAUGH-IN FAMILY alongside children Mark, Fritz, Flicker, Fred, Parkle (and her sometimes twin Charcoal), and twins Simon & Gar. Twice Laugh-In's "News from the Future" nailed future news events. One was the presidency of Ronald Reagan. The other was THIS NOTABLE EVENT, which Laugh-In predicted right down to the year, 1989. THIS FAKE LAUGH-IN AWARD sardonically recognized actual dubious achievements by public individuals or institutions, the most frequent recipients being members or branches of the government. The award itself looked exactly like what the name implied. As a way to pull off a double entendre and make the NBC censors sweat a bit, Laugh-In would invoke the name of THIS DEFUNCT PUBLISHER anytime a cast member would let another member know where they could confirm information on what was previously said.